This is a joint giveaway with Fine and Fair and Natural Parents Network. You may enter at one site only. Please find the section marked “Win it!” for the mandatory entry and optional bonus entries. Baby-love Books is offering our readers a giveaway of Mama, Talk About Our New Baby, a value of $15.99. “Mama, Talk About Our New Baby is the story of a young boy who, with the help of his mother, learns what life will be like after his sister is born. Imaginative and detailed illustrations guide parents and children alike through a variety of gentle and responsive parenting themes such as breastfeeding, co-sleeping, and baby wearing. Mama, Talk About Our New Baby is a children’s book that helps children learn what to expect when a new baby arrives. This attachment parenting-friendly book includes themes such as breastfeeding, babywearing, and cosleeping. This professional-quality book has a hard cover and is twenty beautifully illustrated pages in length. 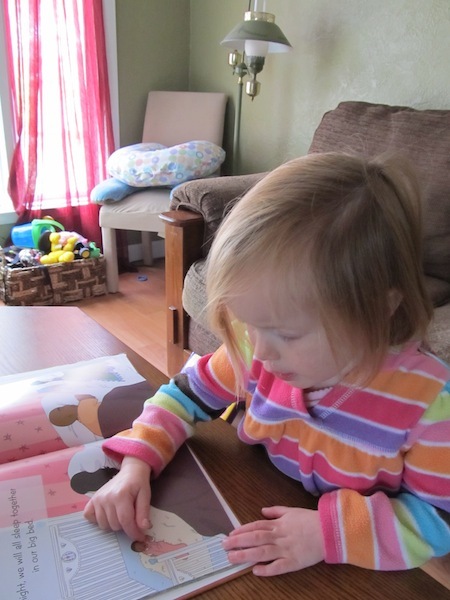 Baby-love books is the team of author Toni Olson and illustrator S. Marie Carlson. Toni Olson is a work-at-home mother of two who had two natural home births and is passionate about empowered birth and the benefits of breastfeeding. S. Marie Carslon combines her love of art with her love of pregnancy and birth. Mama, Talk About Our New Baby is their second creation, following their collaboration on Mama, Talk About When Max Was Born, a book that helps children prepare for water birth at home, and one which was previously given a rave review on Natural Parents Network. As a mother expecting her second child, I have been disappointed by the “mainstream” books meant to help prepare older children for the arrival of their younger siblings. 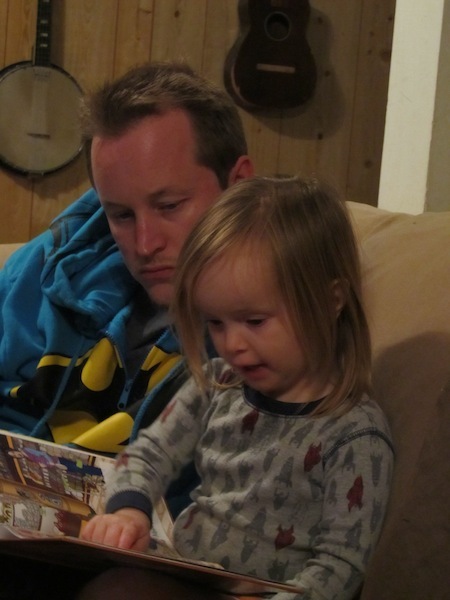 Several friends have given our daughter “big sister” books, and I found that they failed to reflect our style of parenting. In some of the books, the baby was never pictured being held by anyone, but was always in a stroller, crib, or bouncy seat. The books exclusively depicted bottle feeding with no mention of nursing and no images of babies at the breast. That babies slept in cribs in a nursery was stated as a matter of fact. I found myself explaining to my daughter as we looked at these books that we don’t do things quite like that, and having to make adjustments to nearly every page. It was as confusing to her as it was frustrating to me! Enter: Mama, Talk About Our New Baby! This book, written by a work-at-home mother of two, is a breath of fresh air for a naturally minded attached parent. It depicts a family much like our own. The baby is carried and worn in carriers by both mother and father. 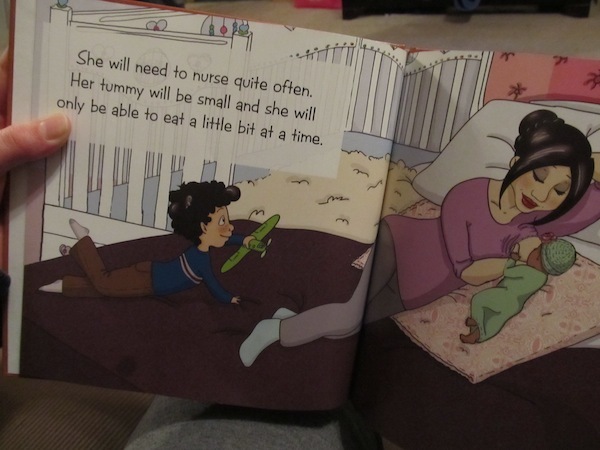 Throughout the book, the baby is shown at mother’s breast, helping to normalize nursing and serve as a reminder to older children who are past weaning. Since this book arrived, my 3-year-old daughter has started nursing her dolls and stuffed animals again! There are images and explanations of a family bed, and the baby’s needs are swiftly and gently met throughout the book. There wasn’t a single aspect of this book that didn’t resonate with our family or that required confusing contradictions or explanations on my part. The colorful and beautifully done illustrations in this book are perfectly detailed without being too busy. In the weeks since this book has been added to our library, my daughter has spent hours exploring, describing, and asking questions about the drawings on each page. The family depicted in this book is multi-racial, and several races are represented throughout the pages in various outings. Mothers and fathers are both shown as involved and loving parents. This book is appropriate for and easily understood by children in a wide range of ages. While many of the books we’ve received have seemed over my toddler’s head or too wordy to keep her attention, the text on the pages of Mama, Talk About Our New Baby is brief enough, and the illustrations interesting enough, to keep her captivated and even ask me to read it again. Mama, Talk About Our New Baby is the perfect book for preparing children in attached families for the birth of a new sibling. The thought and creativity that went into every word and illustration is evident. This book is so well done that I can’t muster a single complaint about it! Even my midwife was so impressed with it (and the Talk About Max book) that she wants to add them to her own library. For attached parents who are feeling frustrated with the lack of representation of their parenting styles in books to prepare older siblings for a new baby, this book will be a refreshing and comforting find. You can purchase your own copy of Mama, Talk About Our New Baby at baby-love books. This book is available for $15.99 plus applicable shipping charges. And just for Natural Parents Network and Fine and Fair readers, baby-love books is giving a 15% discount on all orders from now through December 1. Enter code NPN15 during the ordering process. Be sure to also check out our review of Mama, Talk About When Max was Born, an excellent children’s book about homebirth to add to your library. For your own chance to win a copy of Mama, Talk About Our New Baby from baby-love books, enter by leaving a comment and using our Rafflecopter system below. The winner will receive one copy of the children’s book Mama, Talk About Our New Baby. Contest is open worldwide. MANDATORY ENTRY: Visit baby-love books and tell us one thing you have learned about the company! You must enter your name and email address in the Rafflecopter entry system for your entry to count, after leaving a comment on this blog post. This is a joint giveaway with Fine and Fair and Natural Parents Network. You may enter at one site only, and we’ll be recording IP addresses to ensure that there are no duplicate entries. That said, please do visit and enjoy both sites! Contest closes December 1, 2012 at 11:59 p.m. Eastern Time. Joella works as a Substance Abuse Counselor, and blogs at Fine and Fair about the journey of raising her children as responsible citizens of the world with the values of compassion toward all living things, environmental responsibility, feminism, conservation, and celebrating diversity in all of its forms. My son, who is about to be a big brother. Yes, this would be fabulous! We have a 5yo daughter and are expecting #2. Both books sound wonderful and perfect for our family and our beliefs. Looking forward to reading them to my little one! What I learned from the website: the illustrator is also a doula. I learned that baby-love books writes books for children and their families focused more toward Attachment Parenting styles…awesome! This would be a great book for my son who is going to be a big brother soon! I think this book would be great to help prepare our soon for our new addition. This book would be perfect for my son, who is going to be a big brother. One thing I learned going to the baby-love books site is that they have a book explaining homebirths to little siblings, also. I plan to use this book with our daughter when we are expecting baby #2! Do you ship to Canada for this giveaway? This could help us get our DD ready for #2!!! Sounds like a great book for normalizing birth. Always open to sharing that with my daughters. I’m glad Baby-love books has helpful breastfeeding resources linked on their page – a good resource to pass along. This book would be for my 2-year-old, Sebastian, who is expecting a little brother or sister in May! my daughter will enjoy this book! My daughter will enjoy this book a lot as we are expecting a new baby soon and can find it hard to explain at times. My 20 month old daughter would enjoy this book. this sounds like a fabulous book to use when we are expecting our next baby! My son will enjoy it! !